Four satellites assembled by OHB System AG were launched in November 2016. ?Photo: ESA/CNES/ARIANESPACE. Galileo’s navigation system is continuing to make strides toward a satellite constellation designed to gradually improve the system’s performance and availability worldwide. 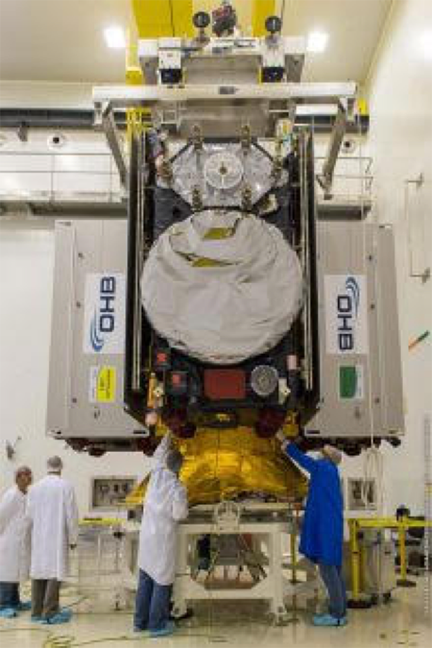 Earlier this month, the European Commission (EC) announced it had exercised one of its contractual options for the European Galileo navigation system and ordered four additional satellites from OHB System AG. In June 2017, the Bremen-based satellite producer had been awarded a contract for eight Galileo satellites under the Batch 3 tender. “Once again, the quality of our navigation satellites has spoken for itself. I am very grateful to the European Commission and the European Space Agency for the confidence which they have placed in us and our partners,” says Marco Fuchs, chief executive officer of OHB SE. “Following the completion of the satellites under the contract awarded in June, we will be commencing work seamlessly on the four satellites under the new contract. The ambitious schedule means that looking forward reserve satellites will be available both in orbit and on the ground,” adds Dr. Wolfgang Paetsch, who is a member of the OHB System AG Management Board responsible for navigation, Earth observation and science. The contract for the four satellites has a value of EUR 157.75 million (about $18.3 million). OHB System AG in its capacity as the producer of the satellite platform and the system manager is responsible for the satellite design and platform, integration and verification. In addition, it will be providing support during the launch preparations and in-orbit verification. The contract increases the total number of Galileo satellites ordered from OHB System AG to 34. Of these, 14 are already in orbit. The satellite constellation is to be expanded incrementally. With a mass of 750 kilograms each, the Batch 3 satellites will be placed in their respective orbit approximately 23,000 kilometers above the surface of the Earth by Ariane 6 2 launchers. MT Aerospace AG, a subsidiary of OHB SE, is the largest supplier for the Ariane program outside the Ariane group. The Augsburg-based company supplies almost all of the tank and structural components for the new launcher. Earlier this year, the ESA signed the contract to build the eight additional satellites for its Galileo navigation constellation. That deal was signed at the International Paris Air Show with German company OHB System AG as the prime contractor, and Surrey Satellite Technology Ltd. overseeing the navigation platforms. It was the third such satellite signing: the first four In Orbit Validation satellites were built by a consortium led by Airbus Defense and Space, while production of the next 22 Full Operational Capability (FOC) satellites was led by OHB. These latest batch satellites are based on the already qualified design of the previous Galileo FOC satellites, except for changes on the unit level – such as improvements based on lessons learned and reacting to obsolescence of parts. ESA’s Director of the Galileo Program and Navigation-related Activities Paul Verhoef signed the contract with Fuchs, and Paetsch, in the presence of European Space Agency Director General Jan Woerner and the European Commission’s Deputy Director-General for Internal Market, Industry, Entrepreneurship and SMEs, Pierre Delsaux. ESA signed the contract on behalf of the European Union represented by the European Commission – Galileo’s owner. The Commission and ESA have a delegation agreement by which ESA acts as design and procurement agent on behalf of the Commission.